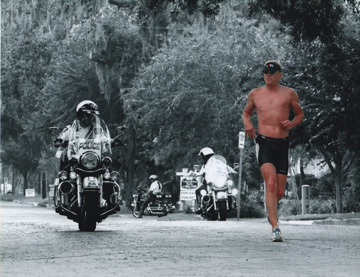 A triathlete’s stride is critical to his or her running performance. Some athletes have a stride that eases across the ground with grace and composure while others appear to strain with every step. However, if each component of the running action is carefully analyzed and developed, even the most ungainly runners can find improvement. Kerry Simmons grew tired of figuratively banging her head against the wall as a civil defense attorney. So now her energetic voice bounces off the walls of the Hofstra swim center, where she trains triathletes full-time. With stopwatch in hand, in sneakers and an oversized T-shirt, Simmons trotted back and forth along the length of the pool on a recent Tuesday evening, instructing and encouraging 13 triathletes in the water below her. Simmons directed the mix of men and woman to swim at full speed while crowded together, to simulate the chaotic start of a triathlon.